Fresh seafood in Campania is an abundant treat that southern Italians are fortunate enough to enjoy daily. Cozze, or mussels, are part of the cornucopia of seafood that Italians call frutti di mare, or fruits of the sea. Cozze have a fresh, delicate flavor that should be subtly enhanced and not overseasoned. Impepata di cozze, peppered mussels, is such a dish that does not overwhelm cozze that have been caught only hours ago, and is quick and simple to prepare. It is popular in Campania, especially in Naples. Cozze are paired with a generously peppered broth spiced with lemon, garlic, olive oil and parsley. A typical recipe can be found here. Cozze can be wild-caught or farmed. Very few mussel foragers in the world practice their trade today, however; in all of Campania, they are farmed. In northern Italy, Ancona is perhaps the only place in the country where cozze foragers still wake up in the early hours before sunrise to gather the catch of the day. The wild-caught cozze from Ancona are, in fact, a Slow Food Presidia. While many people testify that wild-caught cozze have tasty nuances of flavor that farmed ones do not have, just as many claim that farmed cozze taste better and are more flavorful. In addition, they are meatier, easy to farm and quick to sell. When shopping for cozze to prepare for yourself a dish of impepata di cozze, however, be aware of illegal mussel farming. Because they are relatively simple to farm, unsanctioned hatcheries do exist, and can be unclean and environmentally harmful. Know from which farm you buy your cozze before sautéing them in a peppery, lemony broth. Then, with a cold glass of Ischia Bianco DOC in hand, you can enjoy your impepata di cozze with peace of mind. Open air fresh fish markets abound in southern Italy. Below, I’ve listed one in Naples and another in Avellino. Fresh seafood is also easily found in the many seafood shops, or pescheria, and seafood restaurants. Look for the words frutti di mare. The Island of Ischia off the coast of Naples is characterized by a volcanic landscape lush with Mediterranean foliage and swept by sea breezes. This beautiful island, a popular tourist destination, was declared DOC in 1966, making it the first area in all of Italy to bear DOC status. Wine has been produced there for ages, beginning from the time the Ancient Greeks of Calcide introduced grape cultivation and the Ancient Romans called the island Enaria, meaning “the wine land.” The Cup of Nestor, an archaeological treasure, evidences the fact that the Ancient Greeks were the first to cultivate grapes. As a quick and interesting side note, the cup dates from 750 – 700 BC, before Enaria, when Ischia was called Pithekoussai. It is the earliest example of Greek writing. The lines written on the cup are fragmented, but what is there has been translated (here is an example), and seem to refer to inebriation. By the 1500s, Ischia was exporting its popular wine to the markets of Dalmatia on the mainland. Today, there exist seven categories of Ischia wine: bianco, spumante, rosso, Biancolella, Forestera, Piedirosso (called Per’e Palummo locally), and Piedirosso passato. The local and traditional method of grape cultivation is called “in curratura.” It is said to guarantee high-quality wine. It began with the Ancient Greeks, and differs from that of the Ancient Etruscans and Romans. In the hilly landscape of Ischia, terraces are cut into the volcanic slopes and reinforced with walls built of greenstone and tufa (tuff rocks). In curratura methods are yet practiced, but are in danger of fading away due to its slower and labor-intensive techniques, coupled with higher demands for wine due to the large tourism influx. 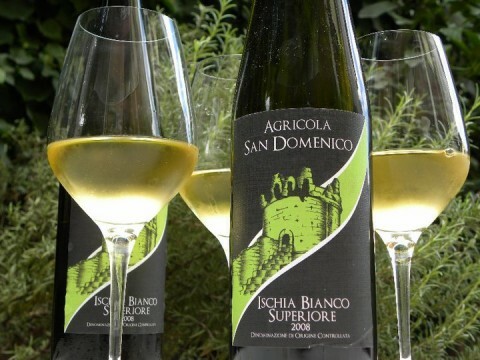 Ischia Bianco DOC has a straw yellow tone, with soft, pleasant, dry and balanced flavors of limes and green apples. Ischia Rosso DOC is of a ruby-red hue, also dry and balanced. It is slightly more tannic and earthy than the bianco. Restrained berry and other subtly juicy flavors are combined with spicy scents. Brief descriptions and summaries of all seven Ischia wine categories can be found here. Vineyard Adventures is happy to arrange tours to discover the DOC wines of Ischia. D’Alise, Luigi. Ischia Wines DOC. 23 Oct 2007. Ischia. Gastronomy – The Products of the Coast. Villagio Baia Serena. Mussels in a Black Pepper Broth. Global Cookbook. Cook Eat Share. Ischia Italian Wine. Italian Wine Center. Ischia DOC. Regione Campania – Assessorato all’Agricultora. Mora, Faustino. Nestor’s Cup. Archaeologies of the Greek Past. Petrini, Carlo. Mussel-bound. 28 Apr 2005. Slow Food. Stanwood, Les. Mussels: How to Forage or Farm Them. Mother Earth News: The Original Guide to Living Wisely. The Island of Ischia: Where the Puttanesca Sauce was Invented. Puttanesca Sauce. Typicalness from Campania. Inside Italy.